Winston Wächter Fine Art is pleased to welcome ceramic artist Dirk Staschke for his first solo exhibition at Winston Wachter Fine Art. Sated, an exhibition of ceramic and mixed media sculpture, will be on view April 9 – May 17, 2013. 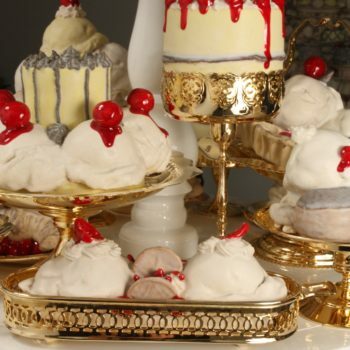 Staschke’s over the top arrangements of cakes, pastries, fruit, and wild game explores the notion of gluttony and cultural excess. Inspired by Flemish and Dutch still life paintings of the 16th and 17th centuries (termed Vanitas or “vanity” paintings), Staschke’s sculptures are precarious in both the balance of the objects and their ability to sate the viewer’s desire. When the viewer walks around the back of the eight foot stacked table of confections (Confectional Facade), they see only hollow ceramic objects without substance. Vanitas genre paintings were created to make the viewer consider their own mortality and to repent upon the exuberance one experienced in their mortal life. Thoughts about life and death, beauty and decay, were all conveyed through a carefully curated collection of symbolic objects. Moving beyond beautiful and excessive imagery, Staschke takes on the mortal world in a fascinating piece composed of arm muscles and bones, extended to hold a bird, which is perched on top of its hand (Premonition). The arm is fleshless and every muscle and tendon is executed in a sublime, realist manner.